If you can’t find the fish, you can’t catch them; and nobody wants to spend time in waters that aren’t holding any fish. Accordingly, most modern anglers rely on electronic fish finders to help locate their quarry. But different anglers prefer different things in a fish finder, and there is no one-size-fits-all option on the market. To be happy with the choice you make, you’ll need to consider your needs, technical savvy and budget when picking your fish finder. You don’t, for example, need a multi-thousand-dollar, cutting-edge fish finder to catch bass in your local pond or chase stripers around a reservoir – you just need a functional, accurate and budget-friendly unit to help you find the fish. And if you are just entering the world of fishing electronics, you probably want to start with an easy-to-operate unit. If this sounds like you, consider the Garmin STRIKER 4dv. The STRIKER 4dv is priced like an entry-level fish unit, but it has a number of key features that aren’t included in most similarly priced fish finders. It is also quite easy to use, and features a very intuitive user interface. And, most importantly, the Garmin STRIKER 4dv is effective and will help you locate the lunkers lurking at your local fishing hole. Thanks to the impressive list of features included in the unit and the impressive way in which the unit performs on the water and the STRIKER 4dv is an attractive fish finder for those looking for a capable, yet budget friendly model. Fishing Tech rates the Garmin STRIKER 4dv as a solid B. Instead of relying on a single frequency, CHIRP sonar transducers emit a range of different frequencies. This provides far greater detail of the world below, and it will allow you to note the differences between rocks and vegetation, for example. Additionally, thanks to the CHIRP transducer, you’ll enjoy greater target separation, enabling you to better distinguish between fish of different species or size classes. Unlike most other fish finders at this price range, the STRIKER 4dv include a built-in GPS circuit, allowing you to navigate more easily and mark productive fishing spots, notable docks, river channels and other important locations with the waypoint feature. The GPS circuit also allows you to track your speed as you pilot around your favorite lake or river. When you pull up the trolling motor and get ready to fish over some interesting piece of structure you found with the STRIKER 4dv, it is time to switch over to the 4dv’s flasher mode. In flasher mode, the STRIKER 4dv displays the lake bottom, your lure and any fish who swim through the beam. This is a great way to vertically jig for crappie or drop-shot for largemouth, and you can even use it to ice fish for perch (consider adding the portable kit to make it easier to transport the STRIKER 4dv across the ice). 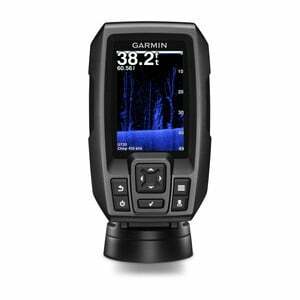 The Garmin STRIKER 4dv boasts a number of impressive features for such an affordably priced fish finder. Some of the unit’s most notable characteristics, capabilities and features are detailed below. It doesn’t matter how good a fish finder’s transducer and processor are if you can’t see the screen clearly, so Garmin included a HVGA 480 x 320 color display to ensure that you can see fish arcs and structure clearly, no matter what weather conditions are facing you. It can often be difficult to find fish while traveling at high speed, but thanks to the STRIKER 4dv’s Ultrascroll mode, this isn’t a problem. Accessible via the scroll menu, Ultrascroll causes the screen to progress more quickly by reducing the image quality slightly. This will help you spot schools of baitfish and big gamefish while cruising over the surface. A good GPS unit is an invaluable tool for the modern angler, as it will make it easy to navigate around the water and find specific places that you’d like to fish. Yet, while some high-end fish finders feature included GPS units, budget-priced models rarely do. Garmin bucks this trend with the STRIKER 4dv, and packs an accurate GPS module into this compact and affordable unit. The STRIKER 4dv uses a tilt-and-swivel mounting bracket, which allows you to point the display in almost any direction. This will allow you to see the screen clearly, no matter where you stand on your boat. The Garmin STRIKER 4dv collects and processes a lot of information, and the split-screen function allows you to visualize this data quickly and easily. You can view a number of different combinations of screens with this function, as well as zoom in on either half of the screen independently. Obviously, good fish finders must be able to handle the splashing that occurs on the deck of your boat, and most high-quality units do so sufficiently. However, Garmin takes things farther than most manufacturers, by sealing the STRIKER 4dv up enough that it qualifies for an IPX7 water-resistance rating. This means your STRIKER 4dv will not only stand up to things like rain (or even snow, if you are ice fishing), it can handle being submerged for up to 30 minutes. While the Garmin STRIKER 4dv enjoyed mostly positive reviews by those who’ve tried the unit, it has its share of strengths and weaknesses, just like any other fish finder on the market. To make sure you end up with the best fish finder for your needs, you’ll want to compare the one you have your eye on with similar products. This includes both other models made by the same manufacturer, as well as those made by competitors. Note that Garmin no longer manufacturers the STRIKER 4dv; they have replaced it with the STRIKER 4cv, which has most of the same features and specifications. The biggest difference between the two units is that the STRIKER 4dv features DownVu sonar, while the STRIKER 4cv features ClearVu sonar – a difference in name only. However, you can still find the STRIKER 4dv at a number of retailers and there are many used STRIKER 4dvs available too. If you are looking for an even more affordable option, you can opt for the STRIKER 4, which only features traditional CHIRP sonar, rather than ClearVu or DownVu sonar, like the 4cv and 4dv series finders have. It will still provide you with good images of the world beneath your boat, even if they won’t be as good as those imaged with ClearVu or DownVu. Garmin also offers two other primary product lines: The STRIKER​​​​ 5 and the STRIKER 7. These units include most of the same features and options as the STRIKER 4 series, but they have 5- and 7-inch display screens, rather than a 4-inch screen. The STRIKER 7sv is the most feature packed unit Garmin makes, and it not only includes traditional CHIRP and ClearVu sonar, but SideVu sonar as well, which will help you scan large swaths of shallow water quickly. As you’d expect, you’ll have to pay much more for the STRIKER 7sv than any in the STRIKER 4 series. The two fish finders on the market that are the most similar to the Garmin STRIKER 4dv are the Lowrance HOOK-4x and the Humminbird PiranhaMax 4DI. They are a both a bit more expensive than the Garmin STRIKER 4cv, and about the same price as the older, 4dv model. The PiranhaMax 4DI has the largest screen of the three (4.3 inches), which will help you see the screen more easily from distant corners of the boat. However, the image quality of the Garmin and Lowrance HOOK-4x are better than those produced by the PiranhaMax 4DI, and the Lowrance unit has a 3-panel viewing function, enabling you to see a ton of data quickly. Like the STRIKER 4dv, the Lowrance finder is also IPX7 rated, so you don’t have to worry about getting the unit wet. Nevertheless, while the Humminbird and Lowrance fish finders both come with several nice features and generally received good reviews by anglers who’ve tried them, neither comes with an integrated GPS. Accordingly, the vast majority of anglers will be happier with the Garmin STRIKER 4dv than either of its closest competitors. If you are looking for a good entry-level fish finder that features GPS, it is hard to find a better choice than the STRIKER 4dv. With an integrated GPS module, an impressive display screen and a flasher mode, it provides anglers with exactly the kind of tool they need to find and catch more fish. FishingTech is happy to give the STRIKER 4dv a B grade.